Doubtless the devout doing what they have been commanded to do. Shocking footage shows the moment a thug sprays clubbers with a ‘noxious substance’ in a mass brawl outside a nightclub. Huseyin Onel, 24, squirted the liquid at the faces of revellers after they tried to stop an attack on man outside the venue in Hackney, east London. The man, who police have not been able to trace, had been punched and kicked after he approached a group of men who were sitting in cars in Alvington Crescent at 5am on May 5. Another group leaving the nightclub then tried to stop the attack, but when one of them began filming the scene on his phone, the men turned on him. As the fight escalated, Onel got a bottle from one of the cars, and then started spraying the noxious liquid in the faces of victims, the Metrpolitan Police said. The suspects then got into three cars and drove from the scene, shouting homophobic insults at members of the group, and that they ‘run Hackney’. The man who filmed the assault was left with a fractured eye socket and corrosive burns to his eye, the force said, adding that he had made a ‘miraculous’ recovery. Seven men were yesterday jailed for a total of nearly 60 years, with Onel sentenced for 17 years for applying a noxious substance causing grievous bodily harm, and three years on extended licence. He was given nine years each for six counts of casting a noxious substance and three years for violent disorder to run concurrently. Other members of the group – Mehmet Tekagac and Onur Ardic – were also involved in the corrosive substance attack. Tekagac, 30, of Homerton, in east London was sentenced to 14-and-a-half years in prison for applying a noxious substance causing GBH, and an additional three years on extended licence. He was sentenced to eight years for robbery and three years for violent disorder, to run concurrently. Ardic, 27, of Hackney was jailed for 14 years for applying a noxious substance causing GBH, plus three years on extended licence. He was also sentenced to three years for violent disorder, to run concurrently. Guven Ulas, 20, of Barnsbury, North London, was sentenced to 30 months for violent disorder. Mustafa Kiziltan, 30, of no fixed abode, but from the Hackney area, was jailed for three years for violent disorder and nine months for dangerous driving. He was also sentenced to three months, to run concurrently, for failing to stop. Serkan Kiziltan, 22, of Hackney, was sentenced to 18 months for violent disorder. 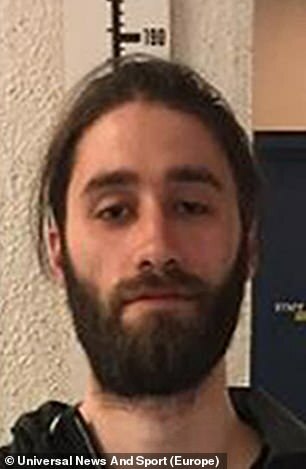 Umit Kaygisiz, 21, of Hackney was sentenced to a total of 28 months in prison for violent disorder and attempting to convey a prohibited item into prison, namely a mobile phone. Yasam Erdogan, 24 of Edmonton and Turgut Adakan, 23, of Hackney were handed 18-month sentences, suspended for two years, for violent disorder. The men were sentenced at Wood Green Crown Court yesterday. Det Con David Leitner led the investigation. He said: ‘Nine violent and dangerous men have been removed from London’s streets today and will now spend a lengthy time locked up in prison. ‘The level of violence used in this attack, coupled with the speed that this incident escalated, are truly shocking. ‘A group of people who were enjoying themselves at the end of a night out were subjected to a sustained and relentless wave of violence including the use of a corrosive substance – because they acted as good Samaritans to help a male being subjected to a vicious assault.